With wedding season upon us, that also means bridal showers are aplenty. Whether you're tasked with planning, or are just a guest, bringing a little homemade something for the table is an appreciative gesture that won't be overlooked. If you're scouring Pinterest for something that says gourmet but is easy enough for even a kitchen novice to tackle, scour no more. 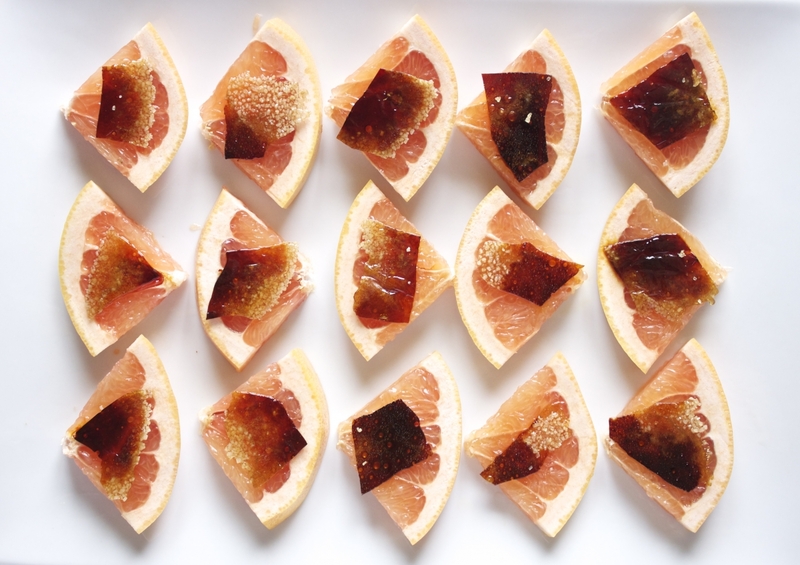 These Fancy Pants Grapefruit Slices from Mackenzie Schieck's blog, Pine and Crave are just the ticket. They look beautiful, taste great and hover somewhere between healthy and indulgent. This shower-friendly recipe is a favorite for several reasons. "It makes for a stunning presentation and the bite-sized pieces are a very practical way of serving this classic combo," says Schieck. Read on for the recipe and some sensible advice on how not to set a small fire in your oven. 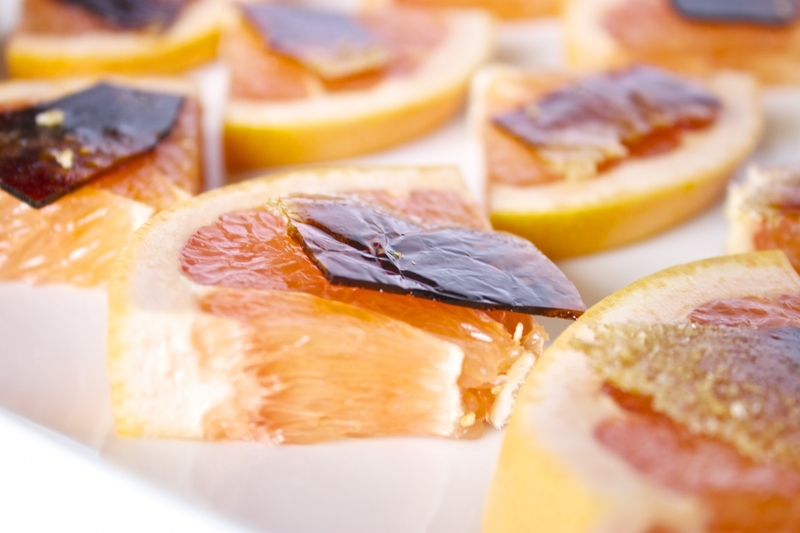 Ingredients: Use 1 grapefruit and 2 to 3 tablespoons of raw sugar for every 4 to 5 guests. 2. Place a piece of tin foil in a medium skillet over medium heat, allowing an inch or two to hang outside of the pan. (You’ll use this to pull the tin foil onto the plate when the sugar is melted.) Make sure the tin foil is lying flat, and wait to turn the heat on until the tin foil is positioned correctly. NOTE: Technically you can do this using your oven’s broiler, but you have to watch it very closely. It can go from melted sugar to a small fire in seconds. Not that I would know. That didn’t happen to me. And that is not a huge part of the reason why I highly recommend making small, 2-tablespoon batches at a time on the stovetop. 3. Sprinkle the raw sugar on the tin foil, making sure it's relatively concentrated so that the granules will melt into each other. 4. When the sugar starts bubbling, turn off the burner, but keep the pan on the stovetop. It'll be a light brown color. 5. When the sugar starts to get a little darker, wearing an oven mitt, hold the plate right to the lip of the pan and use the excess foil hanging over the edge to quickly pull it onto the plate. 6. Allow sugar to cool—this will just take a few minutes. NOTE: This part of the recipe can be done the night before if you'd like. Keep the sugar on the tin foil, and wrap all the "sheets" together in one piece of tin foil. 7. The sugar should easily peel off the tin foil in pieces. Break into 1-inch shards. They will be irregular, but that’s part of what makes the presentation so pretty. 8. Slice the grapefruit into ¼-inch rounds, cut the rounds into quarters, and arrange on a plate with sugar shards placed on each piece. TIP: Place the sugar on the grapefruit just before serving. It actually holds up pretty well—it takes a good 45 minutes to an hour before the sugar starts to noticeably break down (and for the record, it's still delicious like this)—but it’s still best to put off starting that clock ticking until the last possible second.